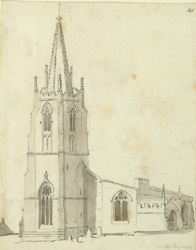 John S Piercy gives this description of St Michael's church in his 'History of Retford' , "The present edifice is small but ancient, standing upon an eminence nearly in the centre of the village, and consists of a nave and south side aisle; it has a handsome octagonal spire upon a square tower, with three tolerably good bells. The exterior of the building is in excellent repair, but the interior is far otherwise, especially the pewing, which is in a very neglected state, there being very few which will afford a comfortable seat. On the 20th of May, 1788, it was agreed by the Corporation of East Retford, that a faculty should be obtained for building a new loft in the south aisle, amid for re-pewing the body of the church, but from some cause or other, it has not yet been carried into effect".